I’ve been putting off replacing the heater core in Red Ryder (a ’98 Dodge Turbo Diesel) for a lot longer than I should have. I’ve been keeping a car blanket in the cab during the winter for a few years now. It generally takes about 30 miles at highway speed to bring the cab to a comfortable temperature when the outside ambient temperature is in the low-40s. I hadn’t observed coolant leaking in the cab…yet. On the return trip from Coeur d’Alene, Idaho, in January this year there were some unusually cold temperatures. Lenny Reed was driving Red Ryder back from the compound installation and sent me a snapshot of the overhead console with a temperature reading of 3°. His caption stated, “My toes went numb about an hour ago.” The bad news was he still had four hours to go. The new Garrett turbochargers are looped through the heater core and that raised some concerns as to the amount of coolant they were receiving across the bearings. I used my infrared thermometer to measure the inlet and outlet coolant temperatures and verified they were receiving adequate coolant. That is one of the benefits of having turbochargers that cool using both engine coolant and engine oil. I’ve had the parts to replace both the heater core and the air conditioning evaporator for a few years now, both purchased from Geno’s Garage. So why haven’t I replaced them? Truth is, it is one of those jobs that no person who has ever done it before would rightfully volunteer to do. Bless YouTube for a plethora of “coming attractions” showing the steps to get the job accomplished. 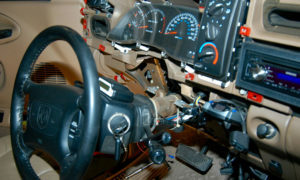 In short, it involves dropping the steering column, removing the entire dash assembly (electronics and vacuum lines included) to gain access to the heater box on the inside of the firewall. 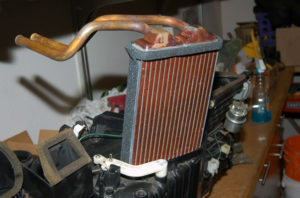 Then you remove the coolant lines, vacuum lines, refrigerant lines and the computer to gain access to unbolt and remove the heater box. Get the picture? Just for grins, it is one of those jobs that will put you upside down, improve your contortionist skill set, and remove the skin from your knuckles and forearms. Knowing all of this, I talked myself into getting it done. There are some suggestions on the TDR website (and other web sources) that discuss faster methods to accomplish the task. I reviewed them. In my years with Turbo Diesels, faster methods do not always equal a quality job. 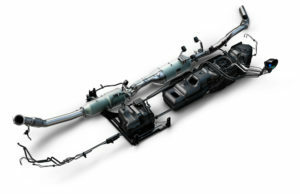 One method suggests using an aftermarket heater core that has a mechanical swivel connection on the supply and return tubes. 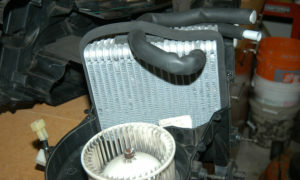 Using this core will allow the installer to remove and replace the core without removing the heater box. 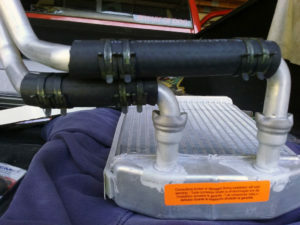 Another uses the OEM core, but recommends cutting the supply and return tubes and connecting them to the old supply and return tubes, using short pieces of heater hose and four clamps. 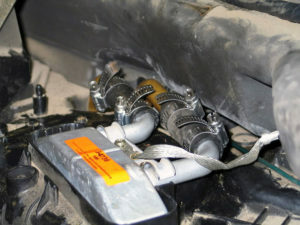 Both methods eliminate all of the steps necessary on the engine side of the firewall (A/C lines, computer, vacuum line, heater box nuts). 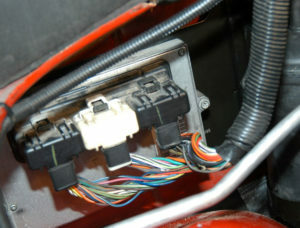 Having mechanical connections on the cab side of the firewall is inviting a leak that will not be contained. (The heater box’s design now contains leaking fluids.) 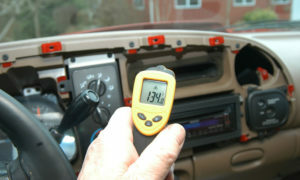 Repairing leak(s) will require removal of the entire dash assembly again. And, the old tubes penetrating the firewall are used as part of this scheme. After 19 years of service, Red Ryder’s tubes were flattened and the corrosive effect of electrolysis had taken its toll. I think it makes good sense to do the job once and do it right. Use OEM replacement parts. 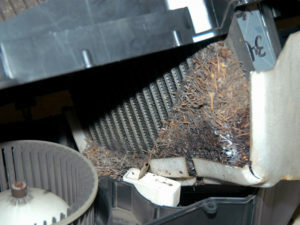 Remove the entire box to facilitate inspection, cleaning and replacing of worn or broken parts as required. Disconnect the negative battery cables. Remove the triangular shaped panels below the dash on both the driver and passenger’s side, exposing the 13 mm bolts that hold the dash assembly on each side. That’s the bolt that holds it all together. Open the glove box and press “in” toward the center on each side and lift the glove box out of the dash assembly. 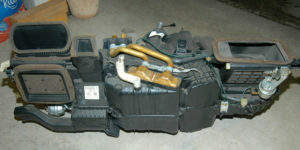 Remove the knee panel below the steering column. Disconnect the gear indicator cable from the indicator and shift the gear selector downward. Details, details, the gear indicator cable. Shift the transfer case into four-wheel low. 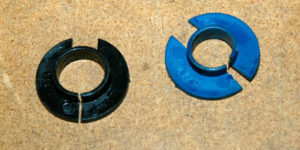 Remove the two 10mm nuts holding up the steering wheel and allow it to rest on the driver’s seat. Drop the steering column down and rest it on the seat. Remove the five screws where the dash meets the windshield interior cowl. Now we’re making progress, removing the dash-to-cowl screws. 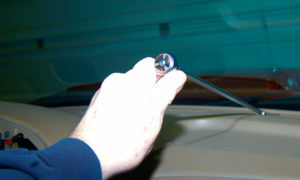 Loosen the two bolts on the driver’s and passenger’s sides of the dash. Do not remove the bolts at this time. Remove the two screws holding the center plastic cover for the SRS. 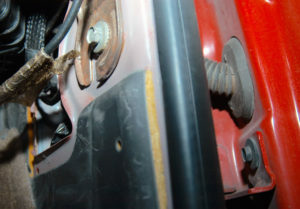 Remove the two nuts and two bolts that secure the center of the dash assembly to the SRS bracket. The dash assembly can now be rotated toward the seat. Lift the driver’s side off of the 13mm bolt and allow the dash assembly to rest on the steering column. Moving to the passenger side carefully lift the bracket off of the 13mm bolt and secure it to the passenger side grab handle using a come-a-long strap. Strap the dash up and out of the way. Disconnect the blend door cable. Using pliers, pull straight up first on the control rod, then pull up on the cable support bracket. Electrical connections and cables are removed. Remove the two nuts holding the heater box to the firewall on the inside of the cab. The first one has a ground wire attached and has two nuts. The second is in the upper right hand corner behind the glove box, facing up. Remove the air box and the three screws securing the ECU to the firewall. Remove the four nuts securing the heater box. 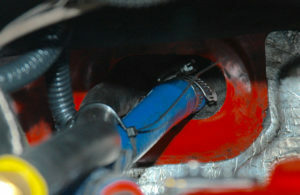 Two are behind the ECU, one holds the AC condenser bracket and the other is located above the rear valve cover. Coolant supply/return hoses are to be removed. Release the A/C supply and return quick disconnects. You will first need to evacuate the 134 from the system (or you can have a shop do it for you). 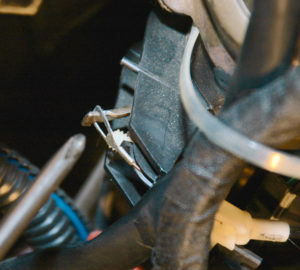 Disconnect the 1/2” and 5/8” A/C lines using a special tool available from most auto parts stores. Disconnect the vacuum line next to the A/C lines. Remove the heater box assembly from the firewall. The box is out of the truck! 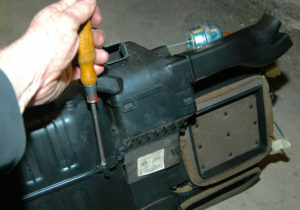 Remove the screws securing the upper and lower half of the heater box. Onward to the heater box internals. Remove the screws securing the heater core to the upper half. Again, here is that dirty A/C evaporator. While the box was apart I carefully cleaned the fan and the interior of the box. I also inspected the blend doors for wear and tear and proper operation. I installed the new A/C evaporator. The Geno’s guys sent me a Cab Fresh exterior filter kit to keep the heater box clean going forward. Reassemble the upper and lower half, making sure the blend doors are in their respective mounting holes and move freely. 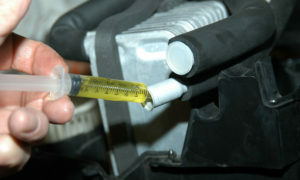 Remove one of the caps and install approximately two ounces of A/C oil. A/C oil added to the system. Check. 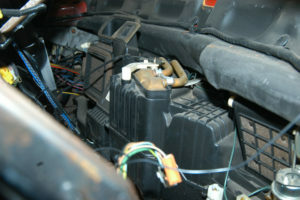 Replace the cap prior to installing the heater box to keep the oil from spilling out. Install the new heater core. 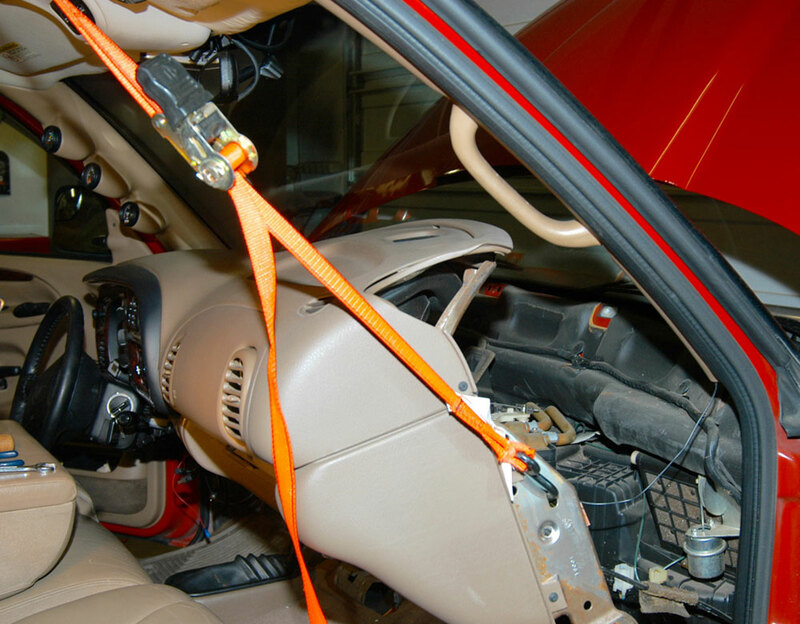 With the new core pushed firmly in place, install the brackets and ground strap. The foam around the heater core and A/C evaporator lines was good enough to reuse. I carefully put a bead of silicone around the penetrating holes on the inside of the firewall for the heater core, A/C evaporator and box drain and slid the heater box assembly back into place. Make sure the heater, A/C and vacuum lines are all in place prior to securing the box. I started with the interior nuts, then secured the four on the engine side of the firewall. I completed the connections on the engine side first and then moved to the interior. After connecting the vacuum, blend door cable and electrical connections, I needed some help. Repositioning the dash assembly worked best for me with two pairs of hands. It is too easy to break so I cautiously repositioned the dash. I found it was easiest to lift the dash onto the two 13mm bolts and roll it up toward the windshield. While one person holds the dash up against the front mounting holes, the other person tightens the two 13mm bolts. Before letting go of the dash assembly, I ran in three of the five top dash screws. I then installed the two bolts and two nuts supporting the center to the floor and completed the installation by securing the five screws on the top. Then I attached the steering column and the shift indicator cable. I finished by attaching the various trim panels. I topped off the fluids, connected the batteries, started Red Ryder and checked for leaks. If you do not have the ability to refill the refrigerant you can have the local shop do it later. 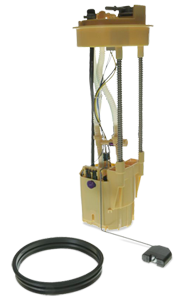 Since there is no pressure in the system, the low-pressure switch will prevent the A/C compressor from switching on. Once the thermostat had opened, I began to take temperature readings. I measured the inlet and outlet temperatures on both turbochargers and across the heater core to confirm coolant flow…all good! Finally I measured the discharge air temperature with the heat on maximum, 134°! The balance of this winter is going to be much more comfortable. I even rolled up my car blanket and put it away. In all, it is a job definitely worth doing, just not one I would want to do again anytime soon. Editor’s note: The Geno’s folks are sending Scott a Cab Fresh Filter Kit to cover the outside air inlet grid and prevent the messy pine straw and debris problem in the interior of the truck. 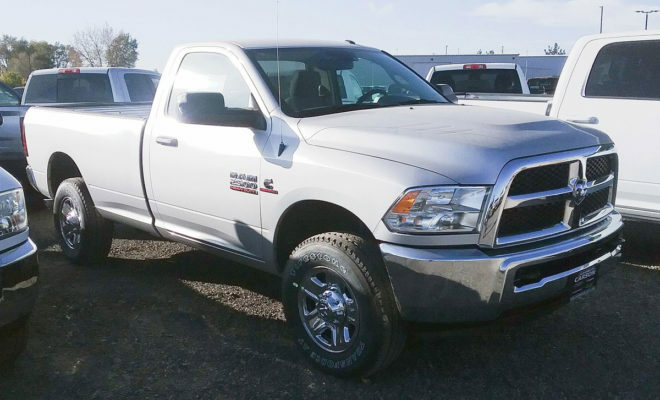 Article originally published in Turbo Diesel Register, Issue 96.